Best Pancakes Ever…and Gluten Free If You Want Them to Be. Posted December 4, 2016 by Heather Michet & filed under Food, Recipes. When in need of a great tasting, nutritious, and easy to prepare batch of pancakes, go to your pantry, bypassing the purchased bag of mix. Whipping together your own ‘cakes from scratch is better for your total health: you get to choose exactly what’s going into them (I bet you’ll pass on including stabilizers and preservatives!) and you’ll feel accomplished having created terrific food that delights you. Here’s my go-to recipe for whole grain goodness loaded with flavor-bursting berries. Mix oats and buttermilk together in a large bowl, making sure that all of the oats are coated with buttermilk. Let rest 10 minutes. Add eggs to bowl; beat them into the batter to break up the yolks and incorporate. Stir in dry ingredients until well blended, but do not overmix. 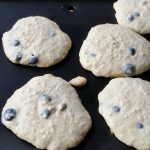 Cook on hot griddle* or cast iron pan until lightly browned on the bottom and slightly bubbly on top. Flip over and cook until the flipped side is golden. Serve with your choice of toppings: I love using butter and cinnamon sugar or homemade applesauce! Pure maple syrup is excellent as well. Make sure it’s Grade B vs. Grade A, to maximize the maximum amount of minerals & nutrients in this yummy plant-derived food. *To ensure equality for all diners, bring that griddle to the table and cook up the ‘cakes right there: nobody’s stuck in the kitchen missing out on the conversation and fun, then left to eat cold food. Do this with your waffles too! I love the “equality for all diners” tip! Hearts full of memory making involvement, mouths full of laughter and engaging conversation and bellies full of what looks to be delish pancakes! Thanks for commenting, Tina! I love the fun & warm dining picture you painted. Equality is indeed, very important when it comes to food 🙂 Enjoy your next pancake party.